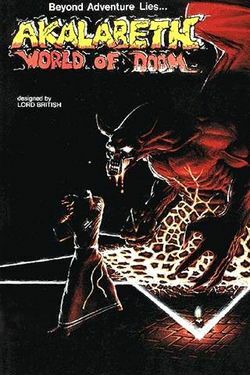 Akalabeth: World of Doom is an early role-playing game, developed and published by Richard Garriott in 1979 for the Apple II. A port for MS-DOS was developed and released as part of Ultima Collection in 1998, titled Ultima 0: Akalabeth. An fan-made version for DOS also exists, developed in 1996. It is faithful to the original: black & white and mute. The later official DOS port, instead, features some colors, background music, and (most important of all) a compass. In the land of Akalabeth, king Wolfgang had two sons. The younger one, Mondain, killed his older brother in order to get to the throne. He was discovered and disgraced. He hid into dungeons, where he kept plotting against the kingdom, and he developed great magical powers. A champion of the kingdom, British the Bearer of Light, defeated Mondain (or was it the Stranger from the future in Ultima 1?). Since king Wolfgang had no more heirs to the throne, British became his successor. After the defeat of Mondain, Lord British called upon several aspirant heroes to clean up the dungeons infested with the evil creations of Mondain. Akalabeth is a dungeon-crawling game, that is a sub-genre of role-playing games where all the action takes place inside a dungeon. Some strategy can overcome the threat of the enemies and the need for food, but the challenge of keeping orientation will always be there. The gameplay of Akalabeth was fully incorporated into Ultima I: The First Age of Darkness, released two years later. In the earlier game, floors are slightly smaller: 9×9 instead of 11×11 tiles. Also, quest monsters are found on random floors (still, always between 1 and 10) in Akalabeth, whereas they will be on fixed levels in Ultima 1. The name comes from "The Akallabêth" (pronounced "akal-labeeth"), a chapter of JRR Tolkein's "The Silmarillion" and the Tolkein mythos' equivalent of the Tower of Babel story. This page was last edited on 23 February 2019, at 09:47.